What is the Best Precious Metal for Your Wedding Band? Home » deBebians Fine Jewelry Blog » What is the Best Precious Metal for Your Wedding Band? 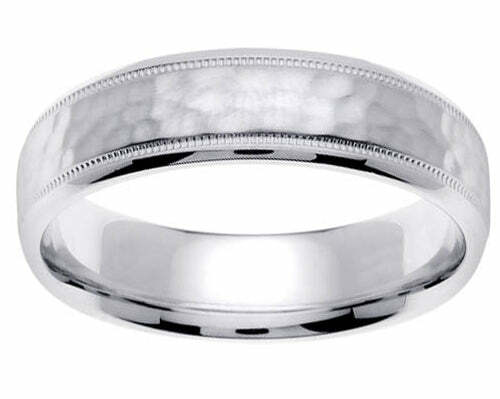 A platinum wedding band will require less processional care than a white gold ring. When purchasing an engagement ring or wedding band, you will encounter many different precious metals that are offer various pros and cons. Even after doing much research, you may be left feeling overwhelmed and confused about which precious metal to choose for your special piece of jewelry. We feel that platinum is the best precious metal for fine jewelry pieces, such as an engagement ring or wedding band. A platinum ring, for example, has many benefits that other precious metals do not. A platinum ring may seem more expensive at initial cost, but what many people do not realize is that a platinum wedding band requires less upkeep than a white gold ring. White gold is a man-made precious metal. Meaning, white gold is yellow gold mixed with white alloys, such as nickel. White gold jewelry is then rhodium-plated to give it the bright white coloring that many people love. This rhodium plating will wear off over time and your white gold jewelry will need to be rhodium-plated and polished every so often to maintain its original appearance. A platinum ring, on the other hand, is pure white the entire way through. It will never require rhodium-plating. A platinum wedding band may develop a patina over time, which is unique to platinum jewelry. A professional jeweler will easily be able to polish the ring to return it back to its brand-new luster. In the long run, if you purchase a platinum ring, you will actually be saving money because it requires less professional maintenance than a white gold ring.